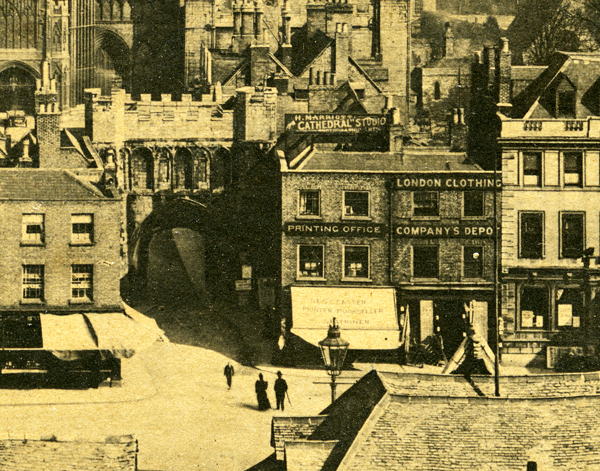 Subjects, styles, advertising, other relevant information: John Magee, described as a photographer, was bound over by Cambridge Magistrates to keep the peace after allegedly assaulting his landlord Walter Frost of 22½ Jesus Lane, Cambridge on 7th July 1893. 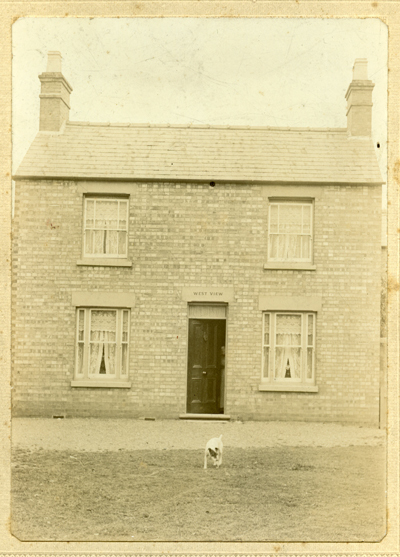 By the time of the 1911 census photography had become William's main occupation and he was described on the census return as a "photographer master", working on his own account from his home at 1 Acorn Cottages, Waters End, Woodston. 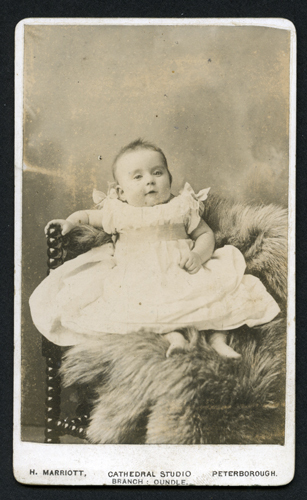 William Henry and Matilda had two children, Dorothy Evelyn (b:1896 Peterborough) and Audas Kisby Major (b:1904 Woodston). See below a photograph of a house, "West View", 6 x 4.25 ins on cream embossed card mount, the reverse has a rubber stamp "W.H. 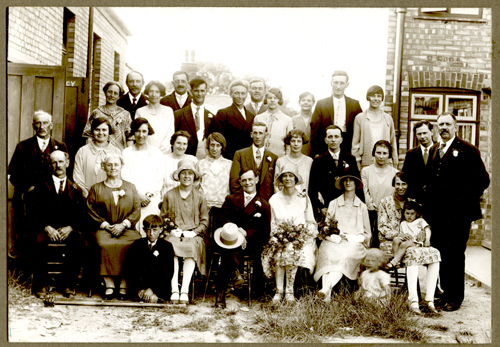 Major Photo' Peterborough" See below this a 1930s wedding group 6 x 4 inches, taken on what looks like a building site outside the emergency exit of some sort of hall. 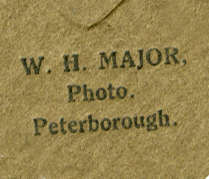 Mounted on brown card with the name "WH Major, Photo. Peterborough" impressed in bottom RH corner of the mount. 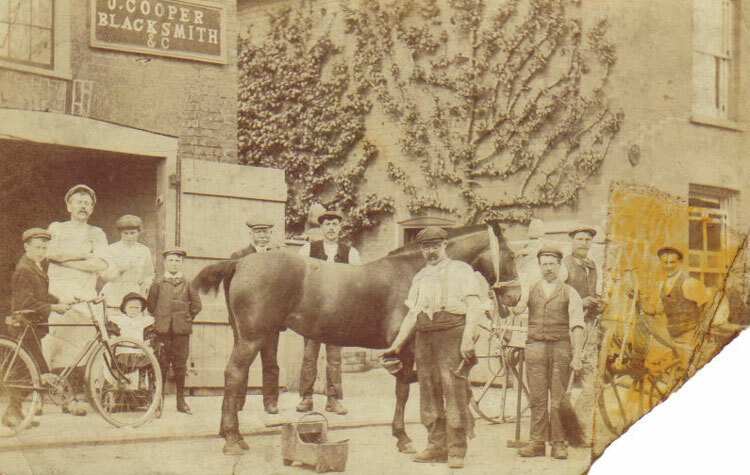 Next is a postcard depicting Cooper's Blacksmith workshop at Benwick Cambridgeshire, taken around 1912. 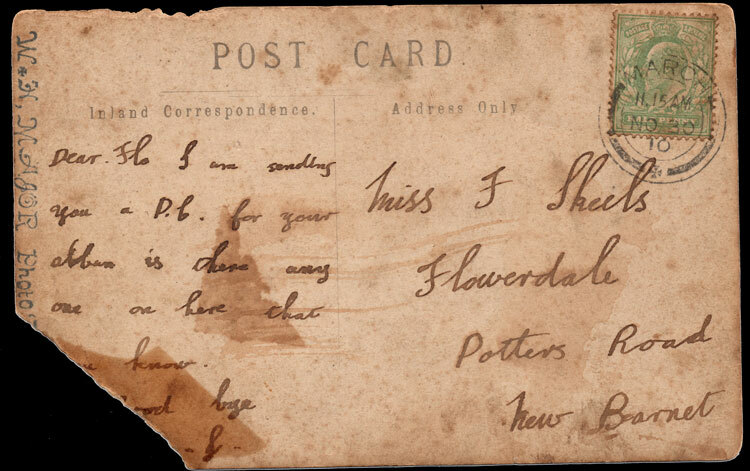 The postcard is the property of Diane Clark, who has kindly given us permission to reproduce it here. Diane's grandfather, Jim Tinkler, is the person on the right hand side of the image with his foot on the wheel of a cart. This very animated image shows how a small business could support a number of people and at the same time be a central focus in a small rural community. The detail of the reverse of this postcard shows the same rubber stamp for the photographer's name as in the first example above - and has a small cross between the "W" and the "H", making the photographer's name appear to be more like "W and H Major", rather than W.H.Major. Perhaps Mr Major set this up with his own rubber stamp printing outfit and he hadn't got enough full stops, or perhaps it was just that he wanted something a little different visually. 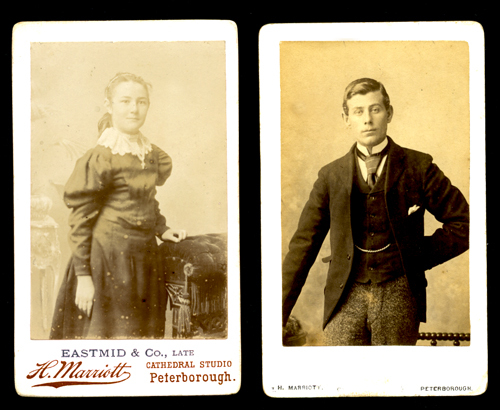 The Peterborough Local Studies Library has a number of Major's glass negatives, deposited by his son. Subjects, styles, advertising, other relevant information: The 1939 Register lists Joseph as a retired photographer at the above address. In the same household was George F Mandue b:2/6/1885 a retired dentist. Nothing further known at this time. Subjects, styles, advertising, other relevant information: Michael Manni was a Cambridge News Photographer, starting with them in 1957, then setting up his own business in 1978. The firm's activities were very far ranging and included press photography, advertising, commercial, PR, weddings, portraits etc. The Cambridge Evening News 31 March 1983 listed a number of the firms staff: Paul Minott, 17 year old assistant, Chris Manni, Michael's wife and business partner, Keith Waterton, manager, Andy Bourne, Sheila West, Lisa Carbis and Paul Whitehead, darkroom manager. An article in Business Week 20 Sept 1990 mentioned the firm's involvement with Cambridge firm Laser Scan in a 3D photographic project. The article included a photograph of John Moffett, the firm's Studio Manager. In the Cambridge Evening News 27 October 1992 it was announced that the firm now had two new Directors, Andrew Smith, dark room manager and Paul Whitehead, studio and production. At this point the firm had ten employees. In the Cambridge Evening News 16 December 1997 the firm announced that in addition to their other services, they were offering to undertake aerial photography for clients. Subjects, styles, advertising, other relevant information: Press Photographers – was this a joint enterprise between Michael Manni and Masons News Service? Working Dates: 1894 - 1912 (Trading presumably was disrupted around 1904 due to bankruptcy, but according to the census return had resumed by 1911). Harry Marriott was the son of a confectioner, John George Marriott (b:1840 Fleet Lincolnshire), living with his family at 35 Brown Bridge Street Peterborough in 1881. By 1891 Harry was a printer's compositor, boarding at Heighham, Norfolk where he was living as a lodger. In the 1901 census Harry Marriott, described as a "photographic artist", lived with his family at 2 Elm Wood Villas, London Road, Peterborough. He was described as an employer- not working from his home address. Harry's family then comprised his wife, Ellen (b:1873 Wickersley, Yorkshire) and daughters Millicent M (b:1897 Peterborough), Marion (b:1898 Peterborough) and Evelyn (b:1899 Peterborough). By 1911 Harry and family were living at 6 New Road Peterborough. His family had grown by then to 8 children in total. He was described as a photographer working from his home address on his own account. 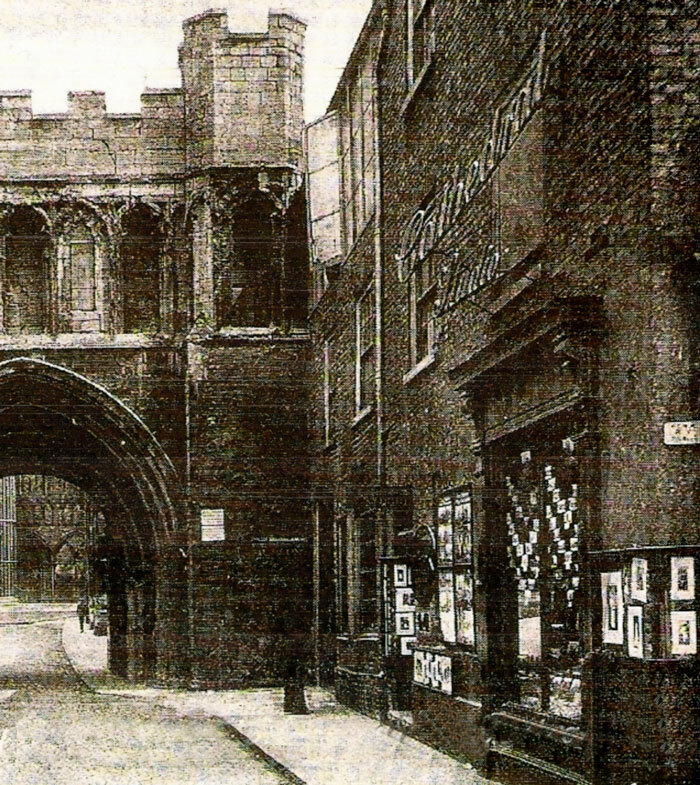 An advertisement in Cook's Peterborough and District Directory, 1894, p188, states: "The Cathedral Studio is the most central in Peterborough having large accommodation for groups; it is replete with every convenience in reception and dressing rooms. Enlargements in oil, carbon and monochrome. Platinotypes at reasonable prices. Cathedral Studio, Minster Gateway, Peterborough. H Marriott, Photographic Artist. HM devotes much attention to groups and personally attends all outdoor work. Copying in all its branches and faithful reproduction from all sizes. If you want a really good picture and likeness you must visit the Cathedral Studio." It would appear that Harry Marriott changed his trading name from time to time and he was also the person behind the Eastmid Studio from around 1898. By 1903 Harry Marriott was in the process of being adjudged a bankrupt. A report of this in the Bucks Herald - Saturday 19 December 1903 records "Marriott, Harry, trading Eastmid's Studio, 2, Elmwood Villas, London Road, Fletton, and 5a. Market Place, Peterborough, photographer. Dec 9." The first two cartes de visite illustrated below, from the author’s collection, mark the end and the beginning of Marriott’s photographic work. The male subject is one of Marriott’s earliest. 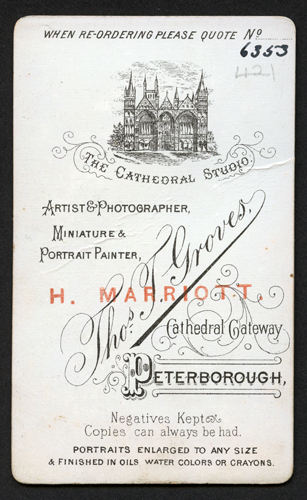 The photograph is mounted on cream card printed on the face “H.Marriott Peterborough”, but on the reverse is printed “The Cathedral Studio Artist and Photographer miniature and portrait painter Thos F Groves, Peterborough. Negatives kept copies can always be had, portraits enlarged to any size and finished in oils, water colors or crayons” and this is overstamped in red “H.MARRIOTT” – so Marriott was using up a stock of his predecessor’s mounts, suitably modified. By contrast, the carte with the female sitter marks the end of Marriott’s work. 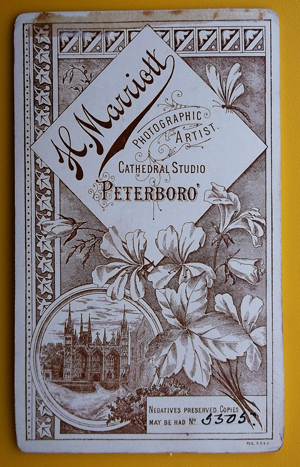 The face of the carte is printed “H Marriott Cathedral Studio Peterborough” but is over-printed by his apparent successor “Eastmid & Co, Late [H Marriott]”. 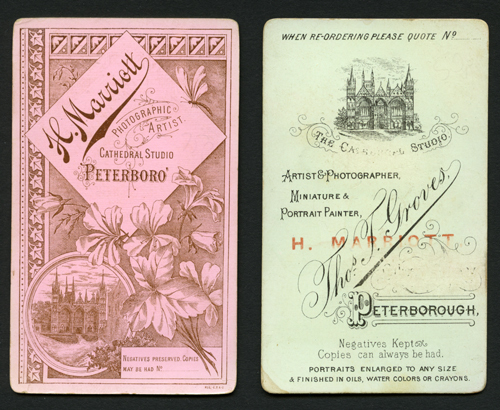 The rear of the carte has a pink tinge with lavish personalised design in dark brown, with flowers, a butterfly and an image of Peterborough Cathedral, with the text “H Marriott Photographic Artist, Cathedral Studio, Peterborough” The Carte mount is marked “Rec C.E.& C” The third carte of a baby, with the faceside and reverse showing side by side, is another early example, with the reverse a Thomas Groves mount over-stamped with the name "H.Marriott". On the face of this mount there is a variation in that it shows in addition to H.Marriott Cathedral Studio Peterborough" that there is a branch at Oundle. 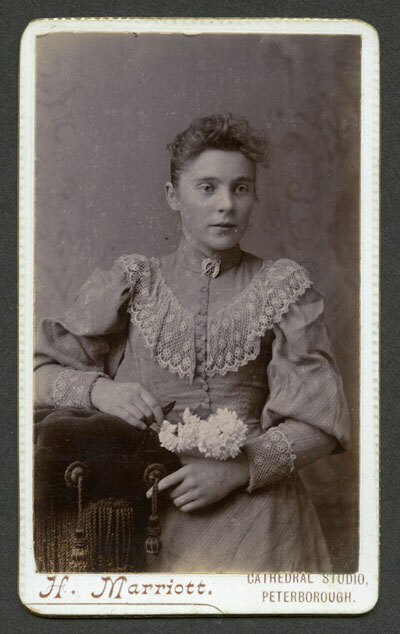 The fourth image is of a carte de visite of an unknown young woman holding flowers. 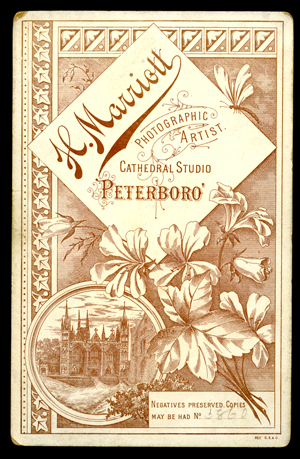 This is on a very pale green mount with gilt edges and gilt text "H.Marriott, Cathedral Studio, Peterborough" The reverse of the mount is blank, negative no 5062. 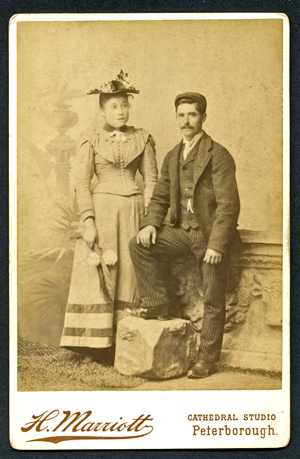 The fifth image below (author's collection) is a cabinet photograph of a couple, the woman holds some flowers. The reverse of the mount is in cream and brown as described above for the cdv. 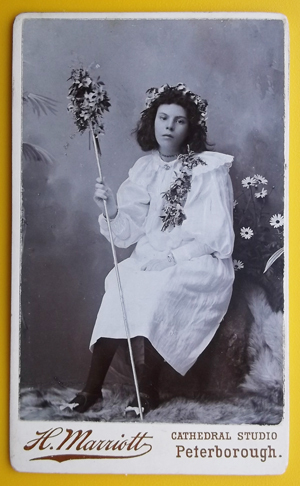 The fifth image continuing the flower theme, from the collection of Simon Shirley, is a carbon print of a girl in a white dress with a floral head-dress and wand - is this simply dressing-up, an allusion to the May Queen or possibly from a stage production of something like a Midsummer Night's Dream? The rather bored expression on the sitter's face is in contrast to her cheerful outfit. The rear of this carte is similar to those above, again with a floral theme. Note the remains of a strip of glue along the top edge of the reverse which at one time would have secured in place a tissue protective cover. The carte is c.1900. On seven occasions between 1894 and 1909 Harry Marriott submitted his photographs to Stationers' Hall for copyright purposes. These are listed below, showing he worked in portraiture, news, sports and the arts. Photograph of football team with officers, Peterborough City 1909-10. Copyright owner of work: David Henry Stott, Kersbrook Villa, Walton, Peterborough. Copyright author of work: Harry Marriott, New Road, Peterborough. Name of parties to agreement: Harry Marriott and David Henry Stott. Date of agreement: 11 September 1909. Form completed: 1 October 1909. Item format: Postcard.TNA COPY 1/538/74. References: Cook's Peterborough and District Directory, WJ Cook, Boston, Lincs 1894 - Cathedral Studio Market Place, Peterborough. The Kelly's Directory of Northamptonshire 1894 also shows a H Marriott at Market Place Oundle. Kelly's Directory of Northamptonshire 1898 - Market Place Peterborough. The Peterborough Directory (Caster) 1901 lists at Eastmid Studio, Market Place, Peterborough. Kelly's Northamptonshire Directory of 1903 lists Eastmid and Co Ltd as photographers on the Market Place at Peterborough. By 1906 Kelly's Directory had no mention of Harry Marriott or Eastmid. The photographer listed on the Market Square at Peterborough in 1906 was Pollard Graham. Subjects, styles, advertising, other relevant information: Another trading name used by Harry Marriott (see above) while operating from the family home in New Road Peterborough. This appears in one entry in the trade directory below. Peterborough Advertiser 8 June 1912 p2 has photos on the building of the GNR Crescent Bridge, Peterborough, captioned "Photos by Marriott and Co Specially for the advertiser"
Subjects, styles, advertising, other relevant information: William Henry Marsh may or may not in the fullness of time justify his place on this site as the extent of his photographic career is currently unknown. William Henry was the son of William Marsh, b: 1834 Branwood Shropshire, dealer in china glass and fancy goods, and Henrietta E Marsh b: 1837 Richmond Surrey. In the 1891 census William Henry was living with his parents at 17 Cowgate and he showed his occupation as “chemists assistant”. On the 1st June that year William Henry filed an application for copyright at Stationers’ Hall London for a 16 cm x 20 cm photograph he had taken of the funeral of the Archbishop of York at the grave at Peterborough Cathedral (TNA COPY 1/404/361). The funeral in question of Most Rev W.Connor Magee, Archbishop of York and former Bishop of Peterborough took place at Peterborough Cathedral on 9th May 1891. This securing of copyright must surely be an indication of practical steps taken by William Henry towards a photographic career. How far this aspiration progressed might be discovered if other examples of William Henry’s work come to light. However, William Henry’s main career was to take a different course. His father died in 1900. In 1901, lodging at 7 Fitzwilliam Street Peterborough with his widowed mother and younger brother, he showed his occupation as a science schoolmaster. In 1911, then a widower, living with his mother in law and daughter at 127 Wendover Rd Aylesbury, he was a school inspector in science, working for Buckinghamshire County Council. Subjects, styles, advertising, other relevant information: Steve Marshall started his working life in various local film processing firms. He returned to Cambridge from Jersey in 1982 and was out of work. He set himself up as a photographer in August 1983, initially working for expenses only, but quickly built up the business. References: Cambridge Yellow Pages 1984. Cambridge Evening News 7 March 1984.